Just to let you know, today was my first day of trading with a mobile catering trailer. After having a day's delay because the gas pipes needed refitting. More expense that I didn't need. Cash and carry visit to get produce turned into a farce, after loading everything onto the belt, the tills go down. So today I wake up, it's raining cats and dogs and very dark. Load up and drive to the pitch, unhitch, lower legs, it's still raining. Try to open the back door, but couldn't. Eventually got in, very wet by this time, the A board had fallen under the latch which stopped me opening the door, the moral of that story is stack your trailer correctly. No customers for 2 hours, then I get 4 turn up, family members, all charged for their bacon cobs and coffees of course. I will be back tomorrow, but more advertising further down the road might help. Anyone starting up, it's hard work but I am sure there are harder ways of making a living. A much better day. No rain, but still dark at 6 am. Set up went well, a good clean of the trailer insides before any customers appeared. First customer at 7.10, fantastic, however no more until 8. Then a steady flow of builders, roofers, electricians and of course the lorry driver. I have found that white van man spends more than the rest. The steady flow turned into a trickle then a drip. A very positive response from all my customers, most said it was the cleanliness of the trailer and me looking smart that made them buy food. Great response and feedback about using branded items ie Nescafe coffee, Yorkshire tea and Heinz sauces. I took a grand total of £41.90 and lots of encouragement from my customers. So, keep everything clean and tidy including your self. Still no sign of the highways dept from the council, this is after they were informed by phone, letter and email that I would be trading from my pitch, does this mean that it a rubbish pitch and they know I will move on or they are happy with me trading from there, time will tell. So this morning was foggy, very foggy, so foggy I nearly drove past the pitch, a little thing inside my head said that if I can't see the turn how can my customers. Got set up, eventually after fighting with the tow bar to release. All was looking good and ready by 6:45, as was I. Clean chefs jacket and hat. Fridge temps and opening checks all done. First customer arrived at 7:05, great I thought, it's going to be a good day. And they were repeat customers. Dribs and drabs came and went during the morning, by 11 I had taken more money than yesterday. By 1:30 I had packed up ready for home as the Friday trickle had dried up, so instead of wasting gas and petrol I decided to call it a day. Lots of great comments about the good coffee and tea again and it looked very clean as did I. So encouraged I am for next week, however I will be set up and ready to go by 6 on Monday. Please Note: That having just opened a mobile trailer in Nottingham, you will need LPG safety checks done and signed off before you can trade. You will have to have these done every 6 months now. PAT certificates are required by some councils but not all, however, would you want to kill someone because you didn't get your electrical equipment checked out? In my opinion get your van/trailer checked out and follow the guidelines that relate to food safety so that you are covered in every way. I traded until I could no longer trade, physically.i was exhausted. You can go the way of making your own burgers, having 6 varieties daily, or buy a decent product to save a lot of time. I made a decent living, but on an hourly rate, if I was lucky £2 an hour. For me as chef, I believe in the quality of the product will increase your footbfootfall. I am just setting up my trailer for trading in Nottingham.I would love to spend the day with you to see how everything is done. You should carry on withthis post most amusing. Wow it was great reading your post. My son is 21 and just bought his first trailer to convert. He is working 75 hours per week in a local pub up here in Newcastle to get the money for "his dream". So I am sure he will go through everything you are. Keep smiling, most of all when it is feeling tough, just remember the reason(s) you started up your catering van in the first place. Wishing you all the luck in the world and hopefully when I'm in Nottingham next I will be a customer. Hi guy's, just keep going. Offer decent food, turn up when you have advertised, and the rest will happen. It takes time to build the business. 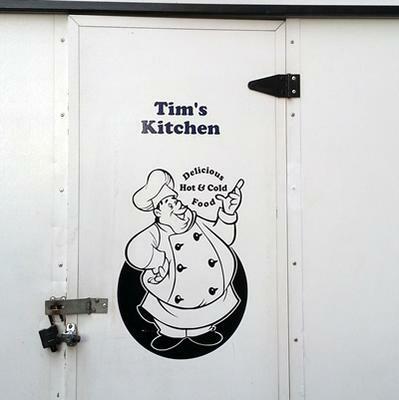 We where crying with laughter at Tims kitchen my first three days so funny not unlike our first day. But the good and bad side of the industry. We are in our 5th week and although we started good its dropped off a bit but we are not deterred it has made us more determined. We are looking Into car boots and events but it's quite hard to get into as we are newbies. Just need a break we are from Rosendale area and the council is quite strict we are on an industrial estate but we are thinking of trying another pitch. Hi guys, well what an eventful few months, i have moved pitches.I now trade in a very long layby just outside of nottingham in a village called Burton Joyce. I have had permission to trade,and i have also taken my toilet with me.It is probably the best move i have ever made in my life. My takings have nearly trebled, so much so i am looking for a bigger trailer and I' still offering the same menu, except a few extras like marinated chicken breast. I have also got a filter coffee machine offering a really great cup of coffee.I will be having a website going live in a couple of weeks as well. You really have to keep the faith to make the business work as it does takes some time. the griddle, A four pot bainmarie,hot water boiler, two shelfs pie cabinet/ warmer. That's all what is running on gas. You thing it can be leaking, must check it. Thanks. How many things are you running on gas? How big are the canisters? Was it full to start with? There could be a leak. My gas lasts me at least a week. for how long gas bottle? 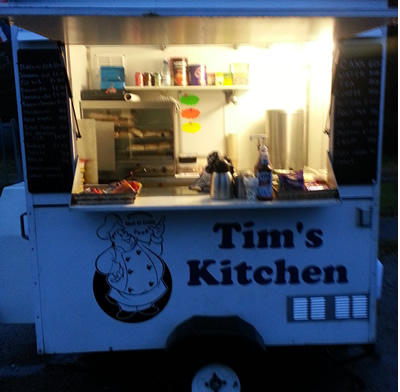 Just a little update from Tim's Kitchen for you all.Business has been improving slowly, no quick buck to be made, which if you want then don't bother with this business. I am loving every minute of trading,even on a saturday when i could be at my beloved Goodison Park, but business before pleasure. I have started trading on a saturday now, last Saturday i ran out of food. Today I had loads left.I did nothing different, the weather was not much different,so there is no pattern at all. getting lots of people coming from recommendations, which is great. Still not sure if the pitch is going to be a major winner, but time will tell. Thanks you for getting back to me and your advice is much appreciated great. I haven’t got a pitch for definite, but i have a few in mind. I live really far from you I actually live just outside Belfast lol so would be very hard to come chat with you. Going to use all electric. These are only my views and experience, i am no expert. I have found that gas is great to control, but a little more expensive to buy,you can go all gas, or all electric,run by a generator or a mix of both which i have. Have you got a pitch? where are you looking at starting up? Gaining a gas safety certificate is most important, the council will not give you approval to trade without it.Come and see me on the A60 just outside of Arnold for a chat. hope this helps a bit. Hi guys, an update for you. I got inspected by the EHO on Friday, and proud to say I will be trading with 5 stars. She spent nearly 2 hours with me, so be prepared. Also be aware of the very stringent hygiene issues relating to E-coli, read about it on the FSA website. Trading has been steady and I have seen an increase in takings, about £30 a day short of my budget, but it is yet still early days. Started a loyalty scheme, buy 5 hot drinks get the 6th free. Opened on Saturday for the first time, and I had to phone my wife for more supplies as I had run out. I am loving the freedom of being my own boss, encouraging customers to be happy first thing, it's great. Still a few logistical issues with supplies. Had 2 of my wooden A frame signs pinched, but I am making some more with "Tim's kitchen" on them this time. Using Twitter as an advertising and networking tool is great as well. Hi Chas, I have spent about £500 on start up costs plus the trailer. This includes towbar, gas safety cert and new pipework. As for the council's, I wrote, emailed and phoned the highways, borough council and city council, local council were helpful and registered the business for me, got the EHO out to me as well. The highways took 7 weeks to get back to me. Register your business first at your home address. Drive around the area you are looking at trading, see if there is any competition in a 4 mile radius. Then find somewhere to work from. Come over and see me on the A60 in Papplewick and I will tell you more. 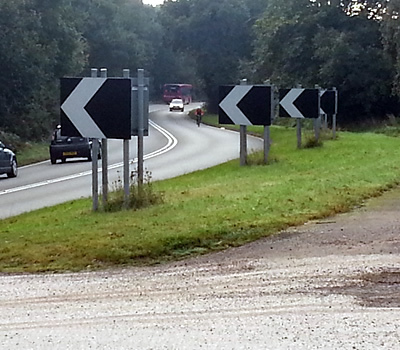 Hi Guys, Just an update, had a phone call from the council highways department today. We wont stop you from trading on your pitch were the words from the lady on the other end of the phone.Which is great news and means that i can plan more for the site, like clean it up. Well done for taking the plunge, I've been trading for 3 months now and can confirm although it is hard work the rewards will come and the satisfaction you get running your own business is well worth the effort. My business was awarded a 5 food hygiene rating by our council in Norfolk and I am sure if you keep your trailer clean, put in place good HACCP and other relevant documentation you too will get a rating you can proudly display to your customers - this and quality products speaks volumes about you, your business and will generate good repeat custom. Finally keep a track of your important metrics - customers per day, average customers per hour, average customer spend, gross profit margins etc etc and you will soon start to see patterns of when, and how people are spending or not spending money with you. This will allow you to develop programs that make and keep your customers loyal. Good luck and stay in there. Im Sailas from Papua New Guinea north of Australia. You have adopted an Atitude of Action that created a positive momentum so bro, keeping pushing. Hi Guys, Thanks for the kind words and support. 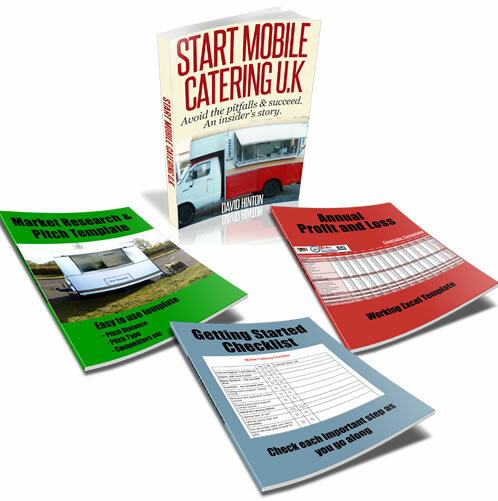 I will not lie, it is hard work setting up a mobile catering business. I am propping up the business by doing some shifts for an agency.I am loving it,my own boss to work when i want.I will do an update at the end of the week,that will be after a visit by the EHO this Friday and another week of trading. Well done Tim, I know as well as most how hard this game is, but don't give up, your doing all the right things and your regulars will biuld up nicely over time, keep going mate. M C T too,i have almost completed 6 months trading and wonder where the time has gone. mobile owners/users but it is my choice and it does get u noticed. If i can give quality and earn a living then im happy and i am sure you will be too,true its a struggle, but it has been worth it and will be for u too,i would luv to read your comments after your first 6 months. Thanks Tim for taking the time to write about your colourful first couple of days trading. I’m sure things will only get better from here now that you have actually started your business. With regards to the council, in my experience they usually turn up after you have trading a good few weeks if at all. Fingers crossed, they will let you earn an honest day’s wage which is good for the economy on the whole. Thanks again and wishing you every success with your new business, and please do keep us updated.